Dr. Bilal Jalil presents part one of three talks on Point of Care Ultrasound. He first discusses the need to take care of the ultrasound machine by keeping it clean and placing probes onto their side cups. After, Dr. Jalil goes into the history of the ultrasound and then into Point of Care Ultrasound. 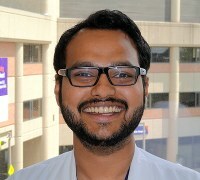 Dr. Bilal Jalil completed medical school at the he Aga Khan University, Karachi, Pakistan and his residency at the University of New Mexico Hospital, Albuquerque, NM. Dr. Jalil's research/clinical interests include: volume responsiveness, hemodynamics, differentiation of shock, and pulmonary hypertension.